Sun Network is reigning over the Tamil Channels for many years. The channel has succeeded in keeping the viewers hooked to it by upgrading the quality of its content over the years. Sun TV has some of the best rated prime time Television serials which hold the highest viewership than any other channel in Tamil. These shows are loved by the Tamil populace living not just in India but across the entire world watching Sun TV Online. Though there are plenty of Tamil channels around and they all provide high-quality content to the viewers, Sun TV has managed to stay ahead of the game. Though there is plenty of high-quality content being dubbed from Hindi, Sun TV’s programs still appeal to the audience due to their Tamil roots which emotionally connect to the audience. Out of the many good serials that appear on this network, let us see the top 5 ones. Written by Ve Ki Amirtharaj and directed by S Kumaran, Deivamagal is a top-rated serial commenced in 2013. The show has been on the top of the charts since the beginning and is still going strong even after 4 years of its commencement. This popular serial features the story of a couple trying to face the conspiracies and plots from people who are trying to strip them of their wealth. The plot focuses on their professional life as well portraying the problems that arise due to their jobs. Fighting the enemies from within and outside the family and keeping the family united is the sole goal of the protagonist and is the strength of this serial. Written by S Ashok Kumar and including a Star cast like Ramyakrishnan, Urvashi, Sandhya Jagarlamudi, Sakthi Saravanan etc., Vamsam is another long-running serial that has been running since 2013 and is still topping the charts. This Tamil show recently completed 1300 episodes in October. The show has been directed by many directors like CJ Bhaskar, K Rajeev Prasad, Arulrai, V Sadhasivam, AP Rajendran, AB Nakeeran, and Suki Moorthy from its inception. Ramya Krishnan who has been the lead actress of the show is also the creative director of it. 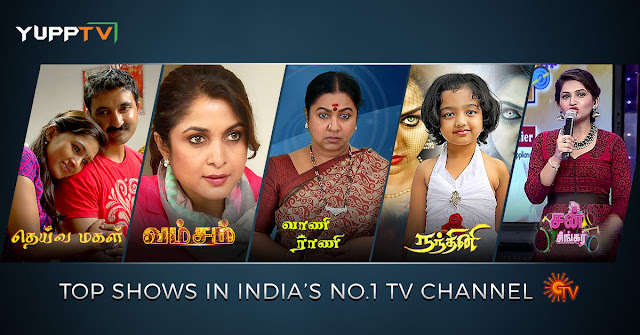 Starring Radhika Sarathkumar, Vani Rani commenced in 2013 with a place on the top-rated shows of Tamil since the inception. This legendary serial completed 1400 episodes recently at the end of October. The show bears a huge cast apart from Radhika Sarathkumar like Venu Arvind, Babloo PrithveeRaj, Arun Kumar Rajan, Vicky Krish, Neelima Rani, Navya Swamy etc. The show was so successful that it had been remade into Hindi which is being broadcast on &TV. The youngest show of all, Nadhini got into the top list pretty soon after its commencement, Nandhini is one of the richest shows in Tamil. The show earned a name for being the second highest budgeted film in Indian Teleserials second only to Naagin. The plot which involves supernatural beings and a gripping story is loved by the Tamil audience all over the world. Written by Veteran Tamil director C Sundar and produced by actress Khushboo, the story casts Khushboo, Vijaya Kumar, Rahul Ravi, Malavika Wales, Baby Adhitri, etc. Reality shows, though on the raise are seldom on the radar of Tamil Entertainment. Bypassing any reality show which is being broadcast on rest of the Tamil Channels, Sun Singer which is a singing talent hunt for kids between ages 6 and 13, tops the TRPs. The show which has completed 5 successful seasons so far is now airing its 6th season. Many Celebrity chief guests have appeared on the show as judges. This reality show which is one of the most watched in Tamil Reality shows is also a product of Sun TV.